Organization XIII's Number II. Nothing else about him has come to light. He vanished, leaving Sora with naught but puzzling words. Apparently Organization members can use the darkness to come and go as they please. Organization XIII's Number II. When Sora called out to him, thinking he was Riku, Xigbar gave a curt reply. His motives and his methods remain unclear. Surely he has a greater goal in mind, but what could it be? Some part of him did seem to be enjoying Sora's reaction. Founding member. He keeps an ear to the ground and a finger on the trigger. Manipulates space. The Organization's No. II, a master of the arrowgun and spatial manipulation. As a long-range fighter, he'll try to keep foes from closing in by warping away as he fires. The full salvo attack he uses in desperate situations is truly devastating. A senior member of Organization XIII. Second-in-command in deed as well as in name. He looks at the big picture and acts according to his unique perspective. One of Organization XIII's members. As Number II, he has Xehanort's trust above all others. His job this time has been to vex Sora and lead him further into the abyss of sleep. This Freeshooter has plenty of defense, and more! Watch out for attacks that lower your strength or overwrite it completely! Despite his defeat at Sora's hands, Xigbar has returned, and continues his attempts to manipulate and mislead Sora. "Rambling? As if! All I'm trying to tell you, traitor, is that your time is up!" Xigbar, the Freeshooter (魔弾の射手, Madan no Shashu?, lit. Magic Bullet Shooter), is the Nobody of Braig, Rank II within the original Organization XIII and a member of the real Organization XIII. He is a supporting antagonist in Kingdom Hearts II, Kingdom Hearts 3D: Dream Drop Distance, and Kingdom Hearts III. Xigbar has power over space, and he uses this to freely redirect the projectiles fired from his twin Arrowguns, as well as to alter the battlefield. He commands the Sniper Nobodies. In Kingdom Hearts 358/2 Days, Xigbar is featured as a playable character in Mission Mode. In an interview, Tetsuya Nomura said that "Xigbar's attacks have a high range, but he has slow reloading time." He also said Xigbar is his favorite character to play as in Mission Mode. Xigbar tells Zexion about the Chamber of Repose. "Oh, don't be like that. Come on. Stay and talk. Isn't it time you told me about Xemnas's secret?" —Xigbar asks Zexion to tell him about Xemnas's origins. Xigbar was formed when his original persona, Braig, and the other five apprentices dabbled too deep into darkness through their continued experiments. Braig found Even and Ienzo lying lifelessly on the ground inside Ansem's computer room, and he was surprised by Xehanort, who summoned No Name and proceeded to stab him in the chest, extracting his heart. In his last moments, Braig asked if the man before him truly was the Master Xehanort he knew, only to be scoffed at, as his attacker preferred to be called "Ansem." Kingdom Hearts 3D: Dream Drop Distance Although his heart would go on to become a Heartless, Braig's strong will enabled his body to continue existing as the Nobody Xigbar. The Nobodies of the six apprentices formed Organization XIII, and they banished Ansem the Wise to the Realm of Darkness. Because of his original self's strong ties to Master Xehanort, Xigbar was aware of the true purpose of Organization XIII. Xigbar found and inducted Marluxia into the Organization. After his return to the Castle That Never Was, he dropped in on Zexion to find out what he knew about Xemnas's private room in the Chamber of Repose, hinting that it is part of pair with a rumored "Chamber of Waking" that lies within the Organization's new headquarters at Castle Oblivion. "Kiddo, the only thing you'll ever save me from is boredom." Xigbar accompanies Roxas on a mission to Agrabah. Present when Xion joins the Organization, Xigbar is shocked when Demyx reveals the eliminations that took place at Castle Oblivion. Later joining Roxas on a recon mission to Agrabah, they overhear Aladdin and Jasmine discussing the rebuilding of their city after many sandstorms strike. Xigbar also tells Roxas that while Heartless leave a heart behind when destroyed, there is nothing left when a Nobody perishes. On a recon mission to Olympus Coliseum, Xigbar tells Roxas about how Nobodies come into existence, and that they are looking to refill the empty seats left by the demise of the Castle Oblivion team. Xigbar later challenges Roxas at Olympus Coliseum when he first enters the Games, claiming to "care about his future." The fight is cut short when the Guard Armor appears. During a mission in Halloween Town, Xigbar takes it upon himself to teach Roxas a "hard and valuable lesson" by letting him vanquish a Heartless that was not their target; he then saves Roxas from an attack by Chill Ripper, their real target. Xigbar meets with Xemnas and Saïx in Where Nothing Gathers several times to discuss the defaulting Xion before challenging "Poppet" himself in Wonderland. Xigbar then sees Xion as Ventus, and Xion is able to quickly strike Xigbar down with the power she was unknowingly sapping from Roxas. While Xemnas and Saïx are annoyed when Xion defects, Xigbar is only amused. Xigbar talks nonsense to Sora. "That's RIGHT, he used to give me that same exact look." —Xigbar compares Sora to Ventus. Not long after arriving in Hollow Bastion and reuniting with Aerith, Leon, and Yuffie, Sora engages a number of Dusk Nobodies in battle around the city. After being led away from the main town, Sora, Goofy, and Donald hear voices mocking them, but they can't find their source. After Sora demands that the sources of the voices show themselves, the remaining Organization members materialize, laughing. Though they are hooded, they are recognizable as the Organization from the description given to Sora and his companions by Yen Sid. The Organization eventually departs, but Xigbar, still hooded, stays behind to taunt Sora further, and compares the glare Sora gives him to the way Ventus used to look at him. Sora dismisses his words as babble, and Xigbar returns to the World That Never Was. As the Organization discusses whether Sora is strong enough to slay Heartless for them, Xigbar assures them that Sora is clearly pure of heart, and calls Demyx on trying to excuse his own laziness. After the Battle of the 1000 Heartless, the members meet again to discuss whether Sora can still be controlled, now that he knows the Organization is using him. Xigbar posits that Sora's altruism will ensure that he continues to slay Heartless, and expresses concern that Xaldin's desire to beat Sora into submission will endanger their plans. Xigbar about to fight Sora. Xigbar then travels to The Land of Dragons, where he transforms a dragon into the Storm Rider Heartless to harvest hearts for the Organization. Sora runs into a hooded Xigbar at the gates to The Emperor's throne room and confuses him with Riku, but Xigbar reveals himself and summons several Snipers to distract Sora as he vanishes. After Axel sacrifices himself to save Sora, Xigbar waits in Where Nothing Gathers and voices confusion at what Axel was trying to achieve. Later, Sora and his friends storm the Castle That Never Was, and are held up by a swarm of Heartless summoned by Saïx in the Hall of Empty Melodies, just as Kairi, Riku, Maleficent, and Pete arrive in two more groups. Xigbar unleashes a rain of bullets from above to destroy the Heartless surrounding Sora. He attempts to confuse Sora by criticizing his skill and treating him as if he were Roxas, then engages him in battle. Though he is defeated by Sora, but as he fades into darkness, he continues to mock Sora's ignorance of Roxas. Xigbar reveals he is half-Xehanort. "Me? I'm already half Xehanort." By the time Sora reaches The World That Never Was, Braig has once again become his Nobody, Xigbar, and makes his entrance to Sora. He explains that he, Young Xehanort, and the others secretly arranged for Sora's journey through the Sleeping Worlds to bring him to their domain. Looking back to see Sora intending to attack him, noting the angry look, Xigbar tells him that Young Xehanort will take his place as the youth places Sora in a deep sleep. Later, as Sora makes his way to the Castle That Never Was, Xigbar confronts him again, and he and Xemnas reveal that the true purpose of Organization XIII was to gather thirteen empty vessels to hold the essence of Xehanort and become other incarnations of him. When Sora demands to know how Xigbar could live with having his personality replaced with another's, Xigbar merely quips that he is already "half-Xehanort." When Sora resolves to fight the two Organization members, a livid Xigbar leaves Xemnas to deal with Sora. Later, in Where Nothing Gathers, Xigbar sits in Vexen's former throne while observing Master Xehanort's return and his attempt to make Sora into his final vessel. He initially mistakes Lea for Axel after Lea unexpectedly arrives to defend Sora from Master Xehanort. Although Saïx and Ansem attempt to thwart the rescue, reinforcements arrive in the form of Donald and Goofy. 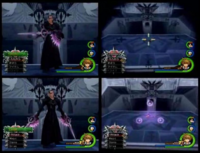 As the heroes advance, the Organization's allotted time expires and the other members retreat to their rightful points in time, while Xigbar, Saïx, and Master Xehanort flee elsewhere. Xigbar gives Sora vague and cryptic advice. During Sora's visit to Olympus, Xigbar has the Heartless attack the already damaged city to put the citizens in more danger. After Sora helps rescue a group from a collapsing building, Xigbar appears and taunts him, saying he will never recover his power like Hercules did; he implies Herc only succeeded due to his divine origin, and that an "average joe" like Sora cannot possibly accomplish the same feat with endangering more people in the process. Nevertheless, he is cryptically supportive of Sora, pushing him to keep looking for his lost power. Before leaving, he gives a final cryptic clue about a "reward" just around the corner for Sora. Later, he monitors Maleficent and Pete's quest for the Black Box in Olympus, feeling disappointed that it was the not the same box, all the while showing knowledge of the "age of fairy tales", such as the Master of Masters' saying "May your heart be your guiding key". Sometime after, Xigbar arrives in Twilight Town and warns Ansem and Xemnas of not being too straightforward with their plans for Sora, reminding them that he has ruined their schemes before and could likely do it again. Xigbar, according to Larxene, seems to be the driving force behind the Real Organization XIII's search for the black box, and seemingly the only member to truly know the contents of said artifact, as Luxord, the main agent tasked with the box's recovery, knows nothing of its contents, besides a vague mention of "hope" existing within it. In the final battle of the seven Guardians of Light against the thirteen Seekers of Darkness in the Keyblade Graveyard, Xigbar appears just as Dark Riku confronts the Guardians, giving him the order of unleashing an army of Heartless to stop them in their tracks, before retreating into a Corridor of Darkness. Xigbar then fights Sora and Riku together with Dark Riku. After his defeat at Sora and Riku's hands, he reveals his apparent reason for having joined Xehanort: Xehanort's promise of bequeathing his Keyblade to him in the scenario of his victory, claiming that the fight would have gone a lot differently had he had a Keyblade. Sora and Riku, furious, claim no Keyblade would ever find him worthy. However, Xigbar claims he would be found worthy, with unsettling security, before teleporting atop one of the labyrinth's walls, then apparently falling to his death, rather than fading away at the two Keyblade wielders' hands. After Master Xehanort's ultimate defeat, Xigbar, having survived his encounter with Sora and Riku, reappears in the Keyblade Graveyard with the black box, just in time to recover the No Name Keyblade. He then summons four of the five Foretellers (Ira, Aced, Invi and Gula) to his presence, before revealing that he is Luxu. In order to fulfill his role, he often switched bodies in order to keep an eye on his Keyblade, and keep its bequeathing chain intact, all the while becoming Xehanort's ally under false pretenses, so he could ensure that the second Keyblade War and the summoning of Kingdom Hearts came to pass, as the Master of Masters had foreseen. Xigbar expresses no surprise at Ava not having appeared, even after he told her his entire role at beginning of the first Keyblade War, claiming she has fulfilled hers. Xigbar's right eye is badly damaged and covered with a black eyepatch. He also has a large, jagged scar extending from his left cheek to just under his left eye. His original self, Braig, received these injuries when he fought the Keyblade wielder Terra in Kingdom Hearts Birth by Sleep. Xigbar is laid-back and cocky, taking pleasure in taunting his opponents. When not on missions, he occasionally enjoys eavesdropping on his fellow Organization members. In the English version of the series, Xigbar speaks with a stereotypical surfer accent, emphasizing his extremely casual attitude, and habitually uses the phrase "As if." He relies heavily on instinct as well as intelligence, making him adaptable and unpredictable in battle. He is described by Roxas as being difficult to trick. Xigbar is one of the more genial members of the Organization, alongside Axel and Demyx, due to his fondness for wisecracks and sarcasm. He is rarely serious, even making sarcastic quips during battle. Like Demyx, Xigbar has given several members of Organization XIII nicknames, calling Roxas "kiddo" or "tiger", Xion "Poppet", and Axel "Flamesilocks". Despite this, Xigbar seems to care very little for his fellow Organization members, such as displaying casual indifference when he tells Roxas that what had happened to the members stationed at Castle Oblivion and even states that he is glad the castle is quieter. In the Organization's final meeting, Xigbar jokingly remarks that there are more free seats. Xigbar does show a degree of empathy on occasion, especially towards Xion when she failed to defeat the Organization's "impostor". Despite his high rank, Xigbar is not given high authority like Saïx or Marluxia, and is instead sent on missions against Sora. He does, however, maintain a position of importance in the Organization due to his past with Xehanort, and is privy to information about the Organization's leader that few others know. Xigbar has a habit of divulging relatively important information to his enemies through his taunts, though he is typically vague enough that they do not understand his meaning, namely his numerous comments to Sora about Ventus and Roxas. Xigbar does not seem to be intimidated by Xemnas as some other Organization members are, going so far as to spy on him in the Chamber of Repose. Xigbar considers Roxas to be a traitor, like the rest of the Organization. Unlike the other Organization members, Xigbar does not express fear or remorse while fading into darkness, instead chuckling rather triumphantly and giving Sora a cocky reply to the final question Sora asks him. Given his general knowledge of Xehanort's plans and his subsequent return, Xigbar may have known beforehand that he would be restored. Xigbar strikes his enemies from a distance, attacking with rapid barrages of laser bullets. He uses space manipulation to teleport, warp his shots, and levitate upside down, making him agile and difficult to hit. Xigbar can open spatial rifts to redirect the shots he fires, enhancing his accuracy. Xigbar possesses deadly aim, as seen in Kingdom Hearts II, when he destroys a group of Heartless surrounding Sora, Donald, and Goofy without harming any of the protagonists even once. In Kingdom Hearts 358/2 Days, Xigbar has a Limit Break called Critical Snipe, in which he fires massive energy bullets at enemies, using an over-the-shoulder third-person-shooter mode to aim. His Final Limit shoots orbs of coloured energy. Xigbar wields two ranged weapons called Arrowguns; the main model he wields is called Sharpshooter. The top of each weapon bears a pattern similar to the Nobody symbol. They are purple, strangely shaped weapons resembling crossbows, and shoot red laser arrows which bend towards a target. Xigbar can create wormholes to direct his shots. The shots can be rebounded at Xigbar using the Keyblade's "Guard" ability. During Xigbar's desperation attack, the Arrowguns are able to fire a massive, rapid-fire stream of powerful rounds, which glow blue rather than red. When held together and charged, the Arrowguns can fire a massive, blue energy arrow that ricochets around the area, and can be angled to hit an enemy multiple times. After several attacks, the Arrowguns need to be reloaded. The Arrowguns can be combined together into a makeshift sniper rifle with deadly accuracy. When Kingdom Hearts II was released in North America, one of the main changes in the game was made to Xigbar's Arrowguns. In the cinematic before the fight, Xigbar combines his two guns together to make a sniper rifle. He uses this move later on in the fight, as well. Due to restraints on video game violence, this was changed in North America and Europe. Xigbar no longer creates his sniper rifle, and instead, he simply spins his guns around, using one gun as a balance to steady the gun with which he snipes. The first person HUD display was changed as well, to make it less realistic. Xigbar's sniper rifle was later brought back for Kingdom Hearts II Final Mix, despite keeping many changes from the English versions, and was retained in the English release of the game in the HD 2.5 ReMIX bundle. Interestingly, the Japanese HUD display is decorated with a black silhouette of Xigbar's individual Arrowguns in each of the four cardinal directions. In Kingdom Hearts 358/2 Days, Xigbar combines his twin Arrowguns into one during his Limit Break, this kept in the English adaption as well, as it lacks the targeting graphic featured in Kingdom Hearts II and Kingdom Hearts II Final Mix. In Kingdom Hearts 3D Dream Drop Distance, Xigbar utilizes his sniper rifle once more in a cutscenes while confronting Sora. The rifle, as well as the scope HUD, were both retained in the English release. After the defeat of Xehanort in Kingdom Hearts III, Xigbar reclaims his No Name Keyblade. Xigbar's signature Arrowgun, the Sharpshooter. Despite Xigbar appearing as a major antagonist in Kingdom Hearts 3D: Dream Drop Distance, Hōchū Ōtsuka and James Patrick Stuart are only credited for voicing Braig in the game's opening scene, and Xigbar's name does not appear at all in the credits. This page was last edited on 26 April 2019, at 12:52.